“I know why her name is Nicky Brown, mom,” I stated confidently. I thought for sure I was on to something. Of course, I wasn’t. I didn’t understand the complexity of race in American culture or the history that hadn’t yet been covered in my kindergarten classroom. The beauty of five year young innocence is things are really that simple. This morning, my kids were dancing to Nepali music videos in the living room. Their daddy and I laughed and commented on how they dance just like the heroes in the Youtube clips. Keeping up the cultural theme, speaking Nepali, Daddy asked our kurtha surwal clad daughter who is running her fifth year if she was Nepali. She quickly replied, “Yes,” then, “No. Because my face isn’t black!” Raising her arms, she added, “And neither are my hands!” (which were the only parts of her showing in this ethnic outfit). I didn’t care about the color of my little kindergartner friend’s skin. We liked to sit together, color, and giggle. A lot. My daughter isn’t oblivious to the fact that she is a fluorescent fish in a school of brown swimmers. She knows she’s different and that her classmates think she’s a little goofy. After all, she’s the only one who eats a peanut butter sandwich instead of dal bhat every day. But she loves her classmates. She comes home babbling about her new best friend every day and the drama of Saisha not loving her anymore, but if she apologizes she can come spend the night. I hope her thoughts on race remain this way. That she will continue seeing different colors, appreciating different cultures, and loving the people represented by each. 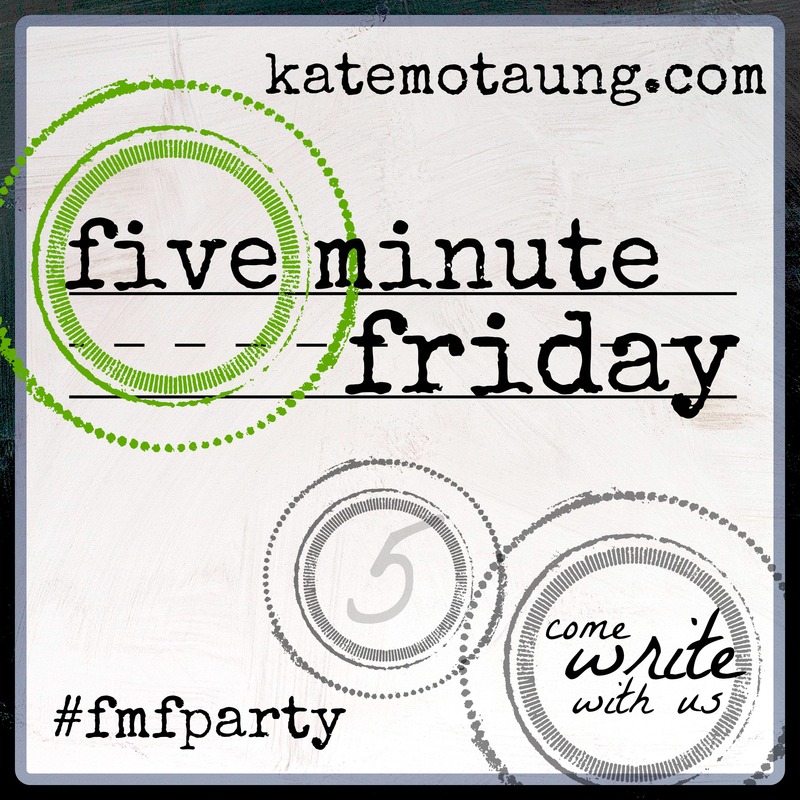 This post is part of Five Minute Friday where many writers join together each week to write for freely Five Minutes on the same prompt and encourage each other along the way. This week, our prompt is FIVE. Join the fun! We are not public dancers, the Taubes. But we enjoy a little living room dancing every now and then to get the wiggles and giggles out of my little ones. For a couple years, my daughter has preferred the song, “Happy” from the Minions movie to get the jiving juices flowing. She was happy (and not just because of all.the.presents). That’s all anyone would have described baby Jo as, and that’s all she ever really was. Unless you robbed her of her fruit snacks, of course. When we came to Nepal, the sad side emerged more and more. It was quiet and didn’t demand much attention most of the time. It was moody and morose but occasionally erupted in red-faced scream fests. I figured she was a little bored at home and that the threes were just plain harder than twos which I had heard to be true. By four, I was, honestly, just grasping for anything to help bring the happy back. I enrolled her in a nearby pre-school. I thought she might be sad to leave the house or scared to get on the bus with kids she didn’t know and who didn’t speak her language. She hopped on the bus like it was Grandma’s car with the car seat loaded up and cup-holders full of goldfish crackers. She played, and sang, and danced and chatted her little English-speaking mouth to death. She came home and crashed on the couch each day. She was exhausted. And happy. And mom was happy to have her joyful Jo and a house full of laughter again. Sometimes the hardest decisions we make end up making us the most happy. A merry heart doeth good like a medicine: but a broken spirit drieth the bones (Prov. 17:22). What are hard decisions you’ve made that lead to your or your family’s happiness? This post is part of Five Minute Friday link up hosted by Kate Motaung. I am enjoying being a part of this writing community and putting together these little posts and getting to know these wonderful people! Join the fun next Thursday night on Twitter! It was just a Tonka truck. Tucked into a 50 pound duffle bag of garage-sale gathered toddler clothes and toys. It was thrown under a plane in Cincinnati, in Chicago, and again in Abu-Dabi along with other travelers’ jet-setting necessities and relocating families’ most prized possessions. It arrived in the back of our little Maruti Suzuki bursting with the gifts of doting grandparents finally arriving for a 10 day stay. The next morning, it spilled out among the spoils spread out upon our marble floor. I nearly gasped at the sight! The previous Christmas, I had placed a Tonka truck on my Amazon wish list, not thinking much how unlikely and inconvenient this request was for a family living in a foreign land. But leave it to Grandma to fulfill these crazy notions bound by far more than my imagination. She revealed to me that she had searched and even prayed while scavenging yard sales in my home town to find one of these golden vehicles of destructive delight. It was just a Tonka truck. But to me, it was so much more. It was a glowing, gleaming expression of an indestructible force- love. Though this tough love is threatened by thousands of miles, it plows and plunders through every obstacle and runs down each hill heaped up by hundreds of hardships. Its work is HARD, and it is quietly admired by those privileged to behold its wonder. Its work is worth doing. Its work challenges and encourages me, though it is most often done without applause or praise. Not many volunteer to take part in the cause. Most cringe a little at the mention at such a tedious, difficult task. It speaks to me of a Savior that gives good gifts, no matter the cost. That toils to soften hard and frozen ground, to love those that are incapable of extending anything worth offering. And it challenges me to love and give beyond myself. When it’s not quite cute and cozy and capable of being captured in a filtered photograph. I’ll roll up my sleeves and do the hard work of loving other people. Across seas. Across cultures. Across the dining room table and down the hall. Across the yellow-tape of my own comfort zone. So thanks, MiMi, for the Tonka truck. Every time Shep vrooms it around the house or throws it down the stairs, I think of you (usually fondly, less so on the latter act). But mostly, I think of the hard work you’re doing. …even if he doesn’t seem to appreciate it like I do.